Infant Mortality Rates, War & Laos – Patrick F. Clarkin, Ph.D. I finished my dissertation on how the war in Laos was correlated to the physical growth of Hmong refugees in 2004. The general idea was that early stressors, particularly prenatally and in infancy, can have long-term impacts on growth and health. The model I was working with came largely from David Barker’s (and others’) ‘fetal origins hypothesis,’ based on evidence that low birth-weight infants tended to grow up to have higher rates of things like type 2 diabates, coronary heart disease, hypertension, etc. A classmate in graduate school, Stephanie Rutledge, introduced me to Barker’s work and told me that I’d find it really enlightening. I did. Sadly, Barker passed away earlier this year, but his work helped spawn a new direction in research. One of the more memorable figures from his book “Mothers, Babies and Health in Later Life” put together two maps: one showing geographic differences in infant mortality rates in England and Wales in the early 20th century, alongside heart disease rates in those same places decades later. The implication was that people in certain places got off to a bad start, and even those who survived infancy grew up somewhat compromised and were more likely to have cardiovascular problems later in life. This made me wonder how these things might apply to Hmong refugees. The medical literature of the 1990s was beginning to document that type 2 diabetes and obesity were increasing in Southeast Asians in the U.S., but they were focused more on the role of adoption of American diets and lifestyles (“Westernization”), which of course were important factors. At the same time, I wondered whether this oversimplified things, and neglected history, as well as the fact that not every refugee from SE Asia came from the same circumstances. I wondered whether those who were born into higher conflict conditions during the Second Indochina War would be worse off as adults than those born into relative safety. One of the variables that would have been helpful was infant mortality rates in Laos and other SE Asian countries before, during, and after the war. But that required some digging, which was fun, but also sobering at how hard it was to find. One problem was that the infrastructure for data collection in Laos was lacking, and I think many of the statistics were unreliable. In any case, these are some of the ones I could find, and they’re only hiding in a dusty dissertation now. Some may be more trustworthy than others (some were simply based on quotes from books, to show how far I had to reach). In general, it looks like IMR has improved over time in Laos, while conflict and minority regions had higher rates than Vientiane. By comparison, the United Nations estimates that IMR in the Lao PDR today is 47.3 per 1,000 births today, while Singapore’s and Japan were around 2. At the other end are countries like Afghanistan (78), the DRC (116) and Sierra Leone (127). Anyway, for any other researchers out there trying to hunt down similar data, I can provide the references. I had heard that a woman named Patricia McCreedy had collected IMR data for USAID during the war. I tried to hunt those down, and looked through a lot of USAID documents, to no avail. 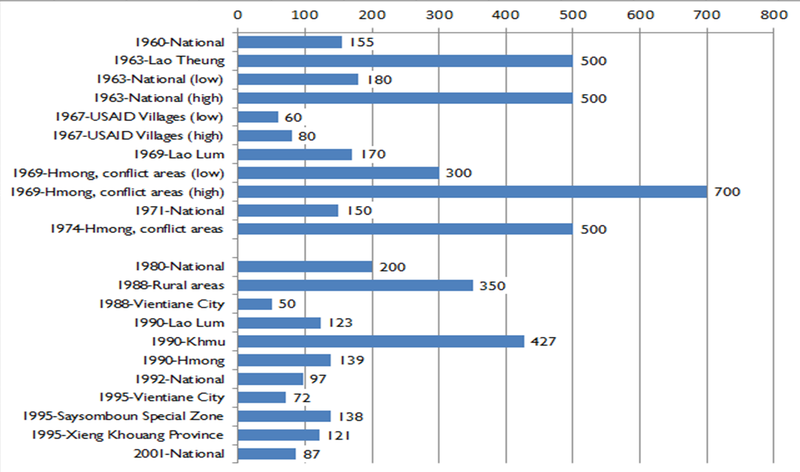 Infant mortality rates in various times and populations in Laos (per 1,000 births). This entry was posted in DOHaD, Fetal origins, Global Health, Health Disparities, Hmong, Laos, Population Health, Refugees, Southeast Asian, War and health and tagged IMR, Infant mortality rate, USAID. Bookmark the permalink. Patrick. Correct, infant mortality rates have declined. On a nation-wide basis, from 95/1000 in 2000, 85/1000 in 2005, 59.5 in 2010, to an estimate of 57.8 in mid 2012. Your figures suggest further improvement since (although the UN has, like every stats agency, had to readjust its figures in retrospect and therefore no snapshot is really correct ~ although the trend is). But infant mortality in Laos remains stubbornly high. The only countries worse than Laos are all in Africa except for Afghanistan. In my book just out (LAOS: work in progress) I make the point that Laos can be recommended for graduation from LDC status as early as 2018, but that infant mortality rates and other health indices will remain among those at the very bottom of the least developed countries. I also make the point that a simple change in the health service might greatly change this situation. Hi Robert, if it’s all the same to you, I’d rather buy and read the hard copy. I think it would be much more useful (and attractive) to have on my shelf as a reference. Where can I find it? If you could help me, please give me the details in my earlier comment but in different genders: male and female.